FoolProofMe - Is Now a Good Time to Buy a Car? Before you hit the websites or showrooms to shop, take a moment to brush up on these pointers. Your wallet will thank you. Trouble is, you normally still have to pay taxes and "fees" and usually dealer prep and such nonsense. All that can total thousands. And then you're one day late on your "zero interest" loan, and the rate shoots up into double digits. $99 A Month! Plus An Instant Rebate! You will not be able to read the fine print on the television ads that push these loans, but if you freeze-frame and get a magnifying glass, you'll see the important wording. Usually you have to pay thousands down, and many times the low monthly payment is for a few months. Then, the payment rockets up. Nice of them. No dickering! No Pressure! In my book, this is the worst and most dangerous gimmick. It's the old "yoyo" scam, but dressed up with better advertising: you sign the paperwork, head home, and are then called back and forced to pay a higher interest rate and/or a higher monthly payment. If you fall for this, you're stuck. What's the solution to all these gimmicks and scams? Forget the advertising. Slow Down. And make your finance decisions before you go to any dealership. Get pre-approved for a loan before you go to a dealership. Determine the true dollar value of your trade-in. Find out what the new car cost the dealer. Decipher the fine print on rebates and other incentives. For more details on these and other tips, review the Car Buying Guide before you start shopping for a car. Know What You Have to Spend on a Vehicle. Pre-applying for an auto loan before you shop enables you to know how much money you have to spend on a car at an affordable payment and for the number of years you want to finance. Our Car Buying Guide shows you how to use that figure plus any equity you have in your trade (or minus any money you owe on your trade) to set a budget. Apply for a loan at two places, and make one of those places a credit union—especially if you've had credit problems, or have little credit. Rate comparisons show that credit union auto loan rates many times are lower than other lending sources. If you're buying a used car, the savings at a credit union can be huge. When you have a pre-approved loan in your pocket before you visit a car seller, you have the hard facts to compare with those manufacturers' "sale" rates hawked in ever-present TV ads. The big problem with those dealer financing ads: In our's opinion, most of those ads are legal "bait and switch" ads: the dealers aren't really planning to give you those low rates or super deals. Buying a car isn't just one step, but many. Car sellers' goal is to maximize profit at every step. Your goal is to save money. The Car Buying Guide shows you how to do that at each stage, including these. Determine the true dollar value of your trade-in. 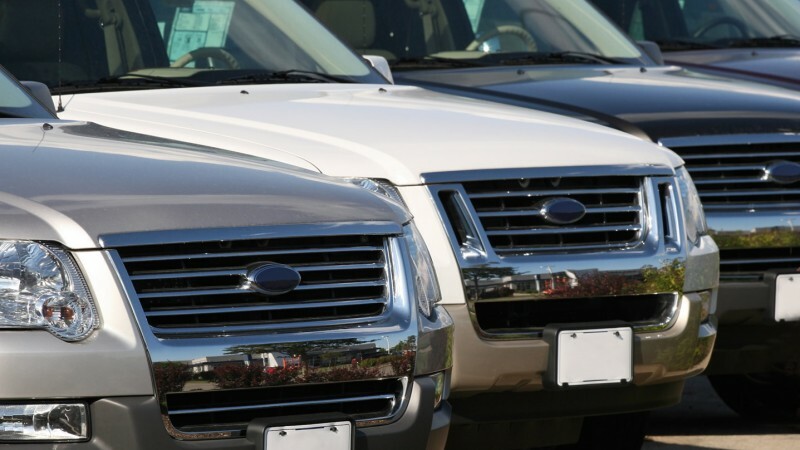 Dealerships make major profits on trade-ins by "lowballing" their offers—paying less than the vehicle's true wholesale value. Find out what the new car cost the dealer. When you know what a new vehicle cost the dealer, you can bargain up from cost rather than down from suggested retail price (MSRP). That sets up the process in your favor. The guide also shows you how to find out what incentives and holdbacks on specific models dealerships receive that affect their net cost. Understand popular sales ploys. Car salespeople have a bag of effective sales gimmicks that have worked for ages. These range from the "I'm your friend" approach of the salesperson to the Four Square pressure negotiation trick, which aims to confuse figures in the deal to maximize seller profits. We show you how to recognize the "hook" behind whatever new "clothes" a gimmick is currently wearing. Decipher the fine print on rebates and other incentives. What's advertised or implied in ads about incentives is qualified and even contradicted in the fine print. We show you how and where to research these details. So, is now a good time to buy a car? Yes, it can be if you do your homework. And that starts, in my view, with a review of our Car Buying Guide and a pre-approved loan.